The oldest gift in the church, this baptistry was a gift from Dr. and Mrs. William Ashmead Schaeffer in 1892. Originally covered with carvings, it was re-tooled in 1960. 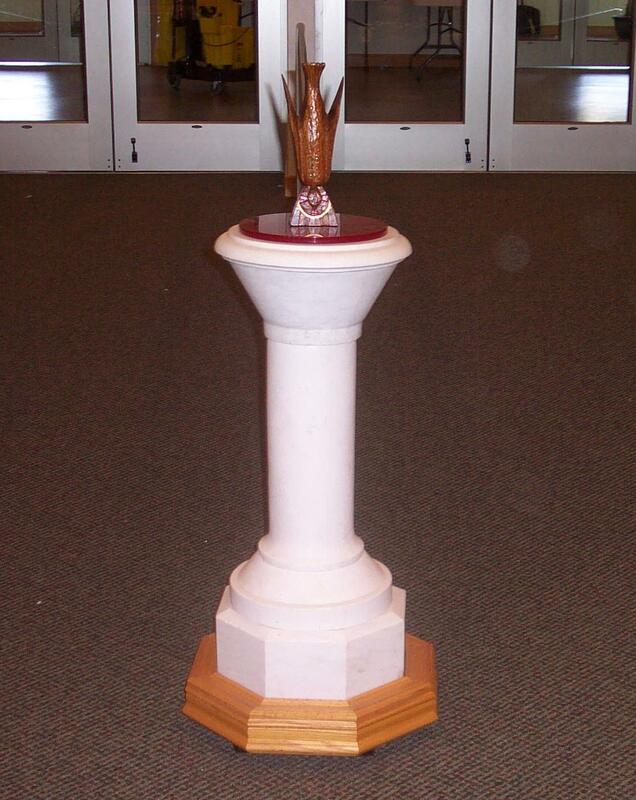 The dove was carved from Black African mahogany by Pastor D.J. Schenck and attached to a red plastic lid which matched the interior decor. It is currently being used in our sanctuary. 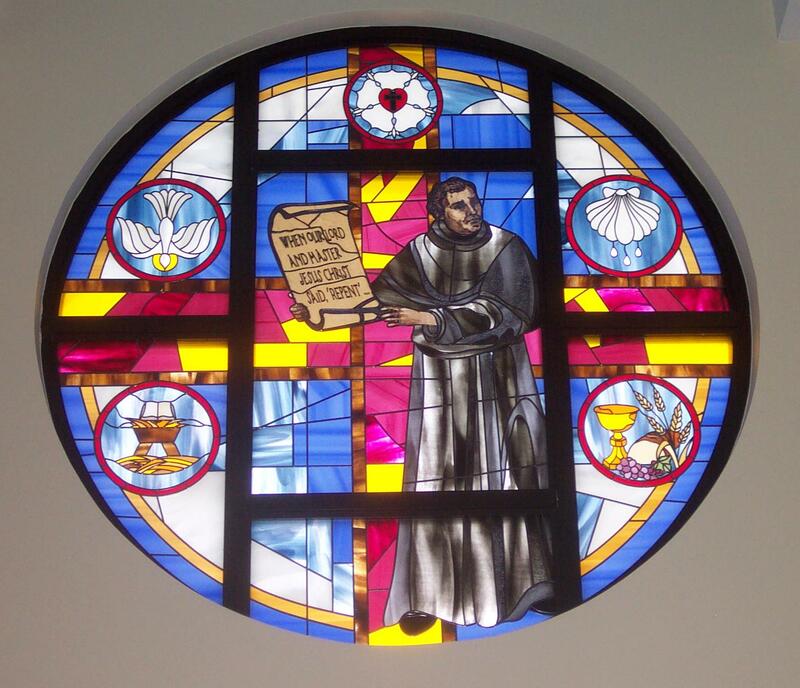 Adorning the front of our new church building is a huge stain glass window of Martin Luther holding a scroll saying, "When Our Lord and Master Jesus Christ said, 'Repent'...." This was a gift by Kathy and Alan Schlienger in 2008. Having begun its worship and outreach in 1889 in Atlantic City, by 1892 St. Andrew by the Sea Lutheran Church had purchased its first land and began construction of an initial church building at the corner of Michigan and Pacific Avenues. In 1893 the church was consecrated and in 1894 called its first regular full-time pastor, the Reverend Dr. John A. Kunkelman. In 1908 St. Andrews was incorporated with a Constitution and By-Laws adopted. By 1910, the church was free of debt and began its first expansion - the excavation and renovation of the basement - for the growing Sunday School and social needs. Steady growth followed into the next decade with St. Andrew becoming fully self-supporting and assuming its full share of benevolence responsibility to the larger church. In 1921, already the church saw the need for further expansion adding property, a building addition, and several new ministry needs including the replacement of the old pipe organ. Into the 1930's the parish grew handsomely thanks to its outreach and communication to the Atlantic City area and became a premier congregation in the city with worship area enhancement again necessary because of the powerful worship and music ministries. In 1937 new property was purchased across from the church as a Parish House for parsonage, Church Office and additional Sunday School space. The eighth pastor of St. Andrew came in 1940 as war clouds gathered and this coastal community would become vital to the war effort. The ministry of the new Pastor and St. Andrew again adapted to the local needs as they counseled and aided many very young men sent by the military for training and recovery from wounds. In the 1950's Pastor Christian Schenck led St. Andrew to a new and deeper involvement and influence in the larger church as well reaching further into the community with the Gospel message and assistance particularly through the church's widely read publication, The Lutheran Church Messenger, later just The Messenger. St. Andrew's growth and community impact were highlighted by a need again to expand so more of God's people could receive and exercise ministry. In the late 1950's, purchasing additional ground contiguous to the existing church, the congregation also took the bold move of authorizing the razing of the old building to make way for a larger and more suitable structure for God's will and work to be done. Thanks to their ecumenical sense, the congregation responded positively to the invitation of a Jewish friend to hold worship in his Shelburne Hotel during construction. In October 1959, St. Andrew joyously relaid their cornerstone now with two dates - 1892 and 1959 - occupying the new church in May 1960 having spent $360,000. The burdeoning congregation - 730 Baptized, 426 Confirmed and 310 Communing - was a well respect center of outreach with Senior Citizen Groups, feeding ministry, a Sunday School program for children with special needs among its response to community need. Through the 1970's as Atlantic City declined and its population felt more and more economically stressed, St. Andrew experienced the same strains but still stood as a beacon ministering now to the growing poor and street populations. The 1980's brought the Casino Control Act and an entirely new focus for the city and the church. How might St. Andrew minister in an environment dominated by the gaming industry? The answer was simple - still care for the people one by one each in the particular way he or she needed care. But standing on the beach or "casino" side of Pacific Avenue also meant the pressure of land acquisition and construction for the new industry. By the mid-1990's, it was clear St. Andrew was facing a huge transition moment in its story. Declining membership and ongoing property pressure moved the congregation to sell the church property to Bally Casino in 1997. Intending to go out immediately and invest the gains in a new church at a new location still committed to Atlantic City, St. Andrew purchased a 4+ acre tract on Absecon Boulevard on the marina side. Soon upon the sale, it became clear that the Brigantine Connector access road for the new tunnel and Brigantine Bridge would nearly bisect their new site. For over six years while carefully guarding and investing funds to redevelop the church and its ministry, the congregation negotiated with the State of NJ and City of Atlantic city with agencies like SJ Transportation Authority and, even the Casino Redevelopment Authority involved. In late 2003 a settlement was reached. In January 2004, with the cooperation of the NJ Synod and the guidance of its Bishop Roy Riley, the congregation extended their Call to the Reverence David McGettigan with the mandate to now finally lead them in rebuilding the church, the congregation and the ministry. Soon came the reminder that the challenges are certainly not over! After careful evaluation and shifting of professional services, there was a dawning awareness that the new site may no longer be the best location for a church. As this determination was unfolding with no apparent easy solution, God opened up a new opportunity. The Pastor was contacted about the "shell" of a new church building on Baltic Avenue between Virginia and Maryland Avenues begun by another congregation but not completed. Following nearly a year of negotiation, in December 2005, St. Andrew purchased this one acre property and “shell” from a bank in Georgia. The City of Atlantic City cooperated in turning over existing permits allowing St. Andrew to secure and complete the exterior while redesigning the entire interior with the assistance of SOSH Architects of Atlantic City and John Mirenda Construction, LLC of Northfield. Construction was substantially completed with a creative design for flexible and effective 21st century ministry. The Congregation was able to begin worshipping in the new facility on Father’s Day, June 17, 2007, returning to the City where it all began. We were finally home! God brought us to His new dwelling! After completing most of the finishing touches, the Church was dedicated on Saturday, March 29, 2008. At an 11:00 am Service of Dedication, Reverend E. Roy Riley, Bishop of the New Jersey ELCA Synod presided and preached. Government dignitaries from the State and Atlantic City attended as well as previous Pastors. Newly completed sanctuary stain glass windows were dedicated. A luncheon followed. Once again, St. Andrew was reborn and was poised to adapt new ministries and techniques for a new generation and a new Atlantic City with emphasis on the growing multi-ethnic and multi-cultural nature of our hopeful island community – all that the Gospel of Jesus Christ might be fully and faithfully proclaimed in word and in flesh! It wasn’t long before new Ministries began. A partnership developed between St. Andrew and Caring Adult Day Care Center of Pleasantville who operated a day care for low income, special needs adults. They remained with us over two years and we enjoyed interacting with their clients. Alcoholics Anonymous and Narcotics Anonymous meetings were scheduled at night, many of them new startup groups. A Food Pantry Outreach was setup on an emergency-needs basis but it became obvious that to serve the people, expansion was necessary. Hope House Ministry which began administering to homeless women and children from the Atlantic City Rescue Mission about 15 years ago was moved back into our Church from a rented location. Hope House continued until December 2013 when after 21 years, it disbanded. St. Andrew’s Hispanic Ministry, Rios de Agua Viva, began to grow under the direction of Pastor Joel DeSouza. The Sunday evening service expanded to include Wednesday evenings in order to accommodate their working members. A children’s education class was started. Singers, dancers, and instrumentalists began practicing to perform during the services. Rios de Agua Viva ministry continued for six years until December 29, 2013 when Pastor Joel and his congregation made the decision to start their own church. To further expand our Ministries, a church bus was purchased as a wonderful outreach to assist people in attending worship on a regular basis. At the ELCA Churchwide Assembly in August of 2009, a Statement on Human Sexuality was approved. Because many people felt this vote and the actions of the ELCA were leading away from the true and authentic Word of God, some churches began leaving the ELCA for an association with another church body. The Congregational Council had been in dialogue with Pastor McGettigan about the issues for a year. As the ELCA began to tighten their hold on churches planning to leave, monthly dialogues were setup for the Congregation to be educated as to the situation. A special Congregational Meeting was called on February 20, 2011, to vote on the First Resolution for Termination of Membership from the ELCA – it passed with more than 2/3 majority. Ninety days later on May 22, 2011, a Resolution to Terminate from the ELCA and affiliate with The North American Lutheran Church (NALC) body was passed. On June 18, 2011, a letter was sent to the New Jersey Synod terminating our membership. In September the NJ Synod agreed to the termination. Meanwhile, the members were notified on July 7, 2011, that we had been accepted in the NALC. We also became a member of the NALC Atlantic District, meeting for the first time on October 22, 2011. A new St. Andrew Constitution was approved by its members on November 20, 2011 and a new phase for St. Andrew began. Likewise, the St. Andrew Women’s Group changed its affiliation from WELCA to Women of The North American Lutheran Church (WNALC). The church women renamed their group to Women in Mission and a new Constitution was adopted. Caring Adult Day Care Center downsized and closed their office at St. Andrew. But the rooms were not vacant for long. The Pastor from Resurrection Ministries stopped in to see if we had space available for their Sunday service and activities. What’s one more church service on Sunday? Not always easy but we all have adjusted to accommodate each other. Along with Resurrection Ministries came Barnabas House. This is a soup kitchen outreach for the homeless founded and managed by Deaconness Moszelle Thomas. Every 4th Saturday, 100+ people are fed a hot meal. Clothing is distributed and health fairs provided for screening. In 2013, St. Andrew joined forces with Resurrection Ministries and Barnabas House became a joint venture. In December 2012, St. Andrew partnered with the Community Food Bank of South Jersey to open a full-service Food Pantry. Deaconness Moszelle Thomas was named Director. Food is distributed on the last two Thursdays of the month. As the membership grew, we qualified for State and Federal free food. This allowed us to hand out not only canned goods but fresh meat, frozen food, and produce. We have purchased a van to help with the pickup of food. The most families we have served in one day is 144. On October 29, 2013, life changed for many living on the barrier islands – Hurricane Sandy came ashore with all its might and fury! It wasn’t as much the wind but the flooding that caused widespread damage. St. Andrew was spared and only our bus and shed suffered salt water damage. But, so many of the homes in Atlantic City had 2-4 feet of water inside. The church turned into a distribution center for food, water, cleaning supplies, toiletries, bedding, clothes, etc. As fast as shipments were delivered from NALC churches, the supplies would go out to the people. Monetary donations were put aside for rebuilding. After several months of coordinating efforts, St. Andrew housed in our sanctuary and meeting rooms, volunteers from the Fuller Center, college student groups on spring break, Americorp, and various church groups, sometimes numbering over 100 at a time. During this time, we housed a children’s daycare center for five months while their place was rebuilt. A senior citizens’ group approached us about space because their PAL meeting room was also damaged. They have been with us nine months and are able to return to PAL. Pastor McGettigan, in an effort to help people sort through insurance paperwork and dealing with FEMA, became a founding member of Atlantic City Long Term Recovery Group (ACLTRG). This group screens low income applicants who need structural repairs to their home but do not have the funds. After applying and receiving grants from the State and private non-profit groups, rebuilding began in earnest on approved homes. It will be an ongoing effort and will take several years before the rebuilding will be considered complete. In the fall of 2013, Divine House of Deliverance began worshipping on Sunday afternoons at St. Andrew. During the week, they have a Bible Study and a Restoration Program for the homeless to help them get back on their feet. In 2014, St. Andrew celebrated its 125th Anniversary1889-2014. On Sunday, August 3rd, St. Andrew officially started their anniversary celebration by having a special Beach Service and breakfast at the Brigantine VFW. Unfortunately, the weather did not cooperate to hold the service on the beach... it was pouring rain! Not to worry. The service was held at the VFW followed by a delicious breakfast made by Eileen & Norm Wiener and their daughter, Barbara. A special T-shirt labeled Summer Sundays, 7:30 am - The Only Place To Be ---The Beach Service! was distributed to attendees. It was a great time for all especially when our bus pulled up with some 10 am Service members. The rain did not dampen spirits but Pr. David said he was conferring with God about some sunshine on Sunday mornings...this was the third Sunday morning in a row with rain! Our formal Anniversary Celebration and Service will be on Saturday, November 1st. We had as our guest and preacher Rev. Doctor David Wendel from The NALC. We had a great anniversary service and then proceeded to the Brigantine Links Country Club for a wonderful luncheon. Pr. David recognized Brigantine's Department of Public Works for keeping the beach clean for our Beach Service each Sunday during the summer. As a token of appreciation, St. Andrew donated $500 in the name of DPW to the Mammal Stranding Center on the island. We also donated to Rev. John Scotland $500 to the Crossroads Youth Group. In December 2014, Pastor David announced that he would be leaving St. Andrew after the Christmas Eve service on December 24, 2015. In early 2015, Caleb House Ministries joined the St. Andrew family and in October, Abundant Life began worshiping here as well. Unfortunately, Caleb House left in November and Abundant Life followed in 2016. We have 3 churches worshiping each Sunday. Pr. David continued to get St. Andrew involved with the Community. Our Food Pantry had grown to such a degree that he streamlined the whole process. It was important to move people through rather than long lines that lasted forever. Everything possible was computerized. Our numbers for serving families for one month was approaching 300. We anticpated having 600 database clients by the end of November 2015. We began providing assistance at the Food Pantry for medical, legal, and social services. Diapers were distributed. We helped clients with no current ID by transporting them to the Motor Vehicles and paying the fee to update their records. Address changes were done online. St. Andrew & Resurrection Ministries sponsored a new Boy Scout Troop 333 on July 17, 2015. This was another way to reach out to the Community. Lots of fun events are planned during the year. They meet every Thursday night 6 pm to 8 pm. The Council was able to secure a local Interim Pastor starting January 1, 2016 for nine months. It is hoped that we will have a new pastor by then. Pr. Neil Jaggie will be our part time Interim. A Call Committee began in January to research, interview and present candidates to the congregation. In October 2015, Pr. David was voted as the new Atlantic Mission District Dean of the NALC. As one of his duties he will assist St. Andrew in looking for a new pastor. Pr. David preached his last service on December 24, 2015, Christmas Eve. It was a beautiful farewell service with several special events. Wedding vows were renewed by a couple who were married 50 years ago on Christmas Eve. A boy from the congregation was given First Communion. St. Andrew wishes only the best for Pr. David and his wife, Kathy. St. Andrew had a retirement luncheon for Pr. David on May 21st at Villa Rifici Restaurant. Members, family and friends were invited. It was fun for all!! Pastor Jaggie, our Interim Pastor, was honored at his last service on Sunday, November 13th with an Appreciation Certificate, framed poem written by Judy Sabbi, and a gift card. He encouraged the church to continue being involved with the everyday happenings of the church when the new Pastor takes over. He wished everyone well. St. Andrew was very grateful for the time and guidance that Pr. Jaggie gave us. After nine months of interviewing for a new Pastor, the Call Committee found Pr. Arlyn Eisenbrandt. The Committee feels that there will be synergy between us and that he is the one to take us on our next journey with God. He will start on Sunday, November 20th. Pr. Arlyn was installed on Sunday, February 12th by our Atlantic Mission Dean, Pr. David McGettigan (former Pastor). We are moving into the electronic age with the Sunday bulletin being displayed on the front wall in the sanctuary during service. Eventually we may stop printing bulletins. The end of January 2017, Resurrection Ministries shutdown their church and moved out. The very same day Ark of Safety Church signed up to worship as our new tenant. They are a very friendly congregation and we were happy to have them. With Resurrection Ministries leaving, Pr. Arlyn wanted to continue Barnabas House on the 4th Saturday of each month. The transition went smoothly and Sharon Crosby is the Director. St. Andrew Food Pantry is continuing to grow. It was decided to go back to registering new people on distribution days. It has increased our registration and our clients are happy with the change. The Food Bank of South Jersey has included our Food Pantry in their Oasis computer-based program. Everything is done through the computers and then gets saved to their "cloud". We are registering approximately 18-25 new clients each month.